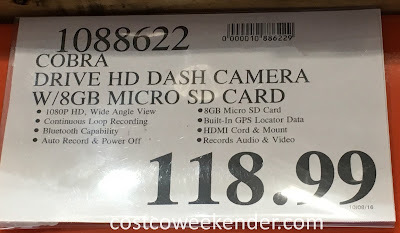 I've been in the market for a dash cam for a while and stumbled on the Cobra Drive HD Smartphone Enhanced Dash Cam (Model CCDC4420) at Costco. One of the features I like is its tie-in with your smartphone. The dash cam can now use your iPhone's GPS to record, on the video recording, your location, speed information and time. Have you been on a trip in a strange city and forgot exactly where you've been? 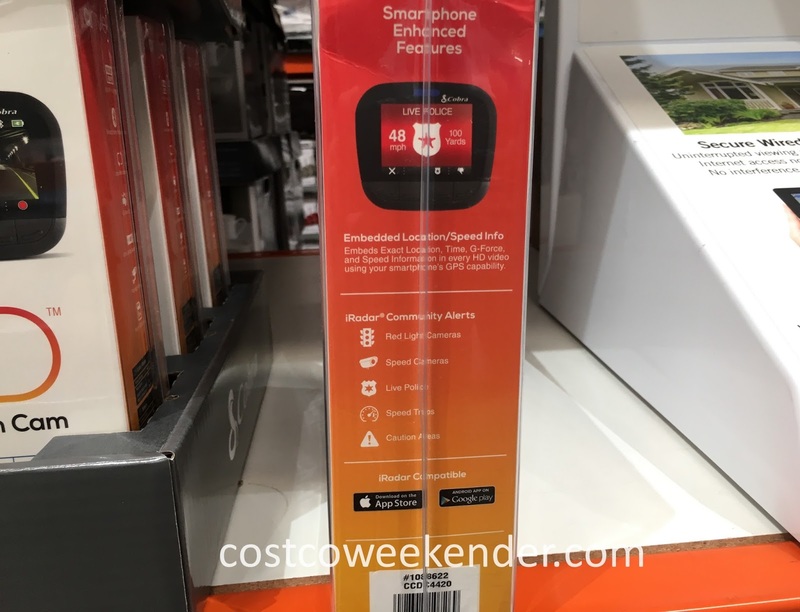 With the Cobra Drive HD Smartphone Enhanced Dash Cam (Model CCDC4420), you have this GPS information documented right on the video. Another cool feature is loop record so that the camera will overwrite old files and continue to record new video. With 1080p HD, you will have crystal-clear images. The dash cam can also be used for safety. Ever been in an unfortunate situation such as a car accident? Was there a debate on whose fault the accident was? The Cobra Drive HD Smartphone Enhanced Dash Cam (Model CCDC4420) can help clear things up on who exactly was responsible. For your car's safety there is parking mode. It provides visual event recording while a vehicle is parked. If motion is detected or the G-Sensor is triggered, the camera will automatically wake-up and start recording. Want to take your Cobra dash cam on a bike ride or down the ski slopes? Action Cam Moded disables the G-sensor and loop recording to free the camera from the confines of a windshield. The possibilities are endless with the Cobra Drive HD Smartphone Enhanced Dash Cam (Model CCDC4420). 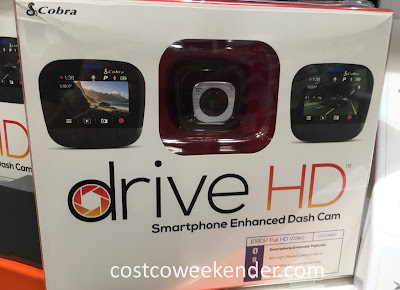 Cobra Drive HD Smartphone Enhanced Dash Cam (Model CCDC4420) Embedded location and speed info - Embeds exact location, time, g-force and speed information in every HD video using your smartphone's GPS capability. The first cam I got was missing the black tightening knob on the mounting bracket so I returned it immediately to Costco and got another dash cam. The replacement dash cam worked for several weeks then the screen started displaying a message to install the SD card which was in the camera in the correct place. Removal and reinitializing the card resulted in the same message. Now I will return this cam. Not happy with this product. Hello @Unknown, thanks for sharing your experience using the Cobra Drive HD Smartphone Enhanced Dash Cam (Model CCDC4420). You shouldn't have any issues getting a full refund from Costco. 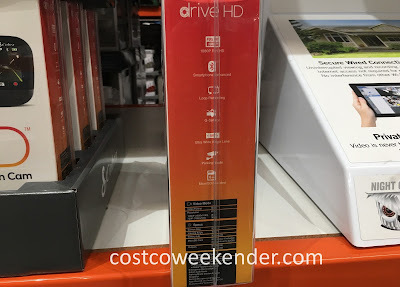 It's a good thing Costco has a pretty good return policy when it comes to products that you're not completely satisfied with or that are defective. Never would connect with my smartphone. Tried everything including contacting Cobra customer support who never responded to my inquiry. Taking back for refund. 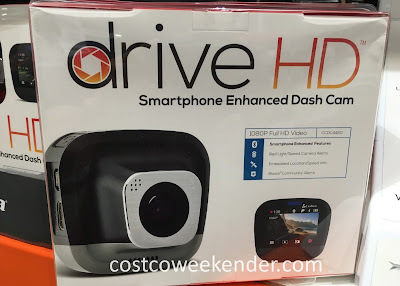 Hi @Unknown, that's awfully disappointing that the Cobra Drive HD Smartphone Enhanced Dash Cam (Model CCDC4420) couldn't even connect to your mobile device and it's even worse that the manufacturer didn't make a concerted effort to rectify. I don't blame you for returning it and I think anyone else would do the same. 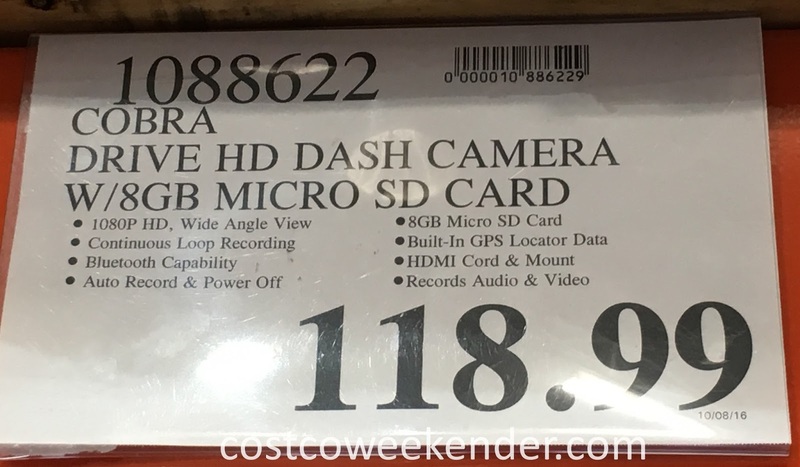 Hello @ControlGuyMN, I haven't seen the Cobra CCDC4488 dash cam at Costco, so I can't really say for sure if it has the rear view camera or not. The Cobra CCDC4420 dash cam which I did see though does not feature the rear camera. Does this cam allow you to review your videos on the unit itself or do you have to take the sd card out and review on a pc or something that reads a card reader? Avoid this Walmart bathroom assembled over priced dash cam. Hello @Unknown, thank you for your review for the Cobra Drive HD Smartphone Enhanced Dash Cam. At least there are many alternative dash cams that anyone can easily get from various retailers if this one is no good.